Earth 2 is set in 2192, roughly 200 years from when it aired. The Earth is in bad shape and everyone lives on space stations with very authoritarian cultures, or colony ships like the one the main characters are on. Many people are suffering from a mysterious illness, the very generically named “syndrome,” and it seems like finding a new home is their only hope for survival. Debate is sparked as the ship approaches a habitable world, but the decision is made for them when it goes haywire and they’re forced to evacuate. On the planet, G889 or alternately “Earth 2,” the discover two species of aliens: the intelligent but very different Terrians, and the underdeveloped Grendlers (imagine some kind of proto-Ferengi ancestor, and that’s about how they behave). It also turns out that the world was formerly used as a penal colony–some punishment, sending the criminals to live on a nice new planet while the good citizens are trapped in space stations that slowly kill them–and so we end up with renegade humans from time to time, too. You can see how all this maps pretty clearly onto the traditional Western template: a “wagon train” through the frontier with little contact to civilization, the closer-to-nature “noble savages” in the Terrians, rustlers and bandits in the form of the Grendlers, and outlaws causing trouble from the penal colonists. Alonzo with a Terrian. They’re tall and bony-looking, but supposedly closer to plants. I’ll get into the details later, but suffice it to say the show has a major investment in environmentalist ideas, and in particular models the sci-fi aspects on the Gaia Hypothesis, in which a planet is essentially viewed as a living organism of its own, with the individual species on the planet performing vital roles in keeping the ecosystem healthy. Of course, the hypothesis is often misinterpreted by laymen as implying the planet is alive itself, which kind of misses the point, but that’s sort of how it comes across here. Earth 2 has a lot of characters, almost too many. The female lead I mentioned before is Devon Adair, who is technically the leader of the expedition but spends way more of her screen time acting as mother to Ulysses “Uly” Adair, her young son who suffered from the Syndrome. He’s one of two kids, the other being a young girl named Tru, and they don’t get along at all. A huge chunk of the pilot is taken up by these two kids arguing. Uly ends up being plot relevant, as he’s quickly chosen as the primary connection between the Terrians and the colonists. Tru’s father is John Dazinger, who was an indentured servant drafted into service on the ship and not really interested in colonizing at all. Julia Heller is their inexperienced doctor, and Alonzo Solace is a pilot who ends up being more useful than you would expect a pilot to be when there are no planes or spaceships. A few other characters (the cyborg Yale, Bess and Morgan Martin, etc.) are about, including Gaal, who’s played by one of the only recognizable faces on the show, Tim Curry. 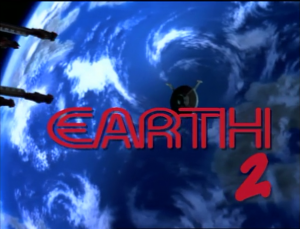 Earth 2 is kind of like Defiance in that it has a really interesting, well-developed backstory that isn’t quite utilized to its fullest extent. But given that it was only in its first season, this show gets a pass. Suffice it to say, the situation back in the solar system is very dystopian, on the order of Cyberpunk projected 100 or so years further into the future. It’s revealed in bits and pieces as we go along and the picture is bleak. A very interesting and unusual backdrop to set the show against. Terrians are definitely interesting as TV aliens go; while they are humanoid in appearance, they’re quite a bit weirder than that in terms of behavior. They can perform things that really shouldn’t be possible, like communicating through dream-states and emerging from the earth without leaving tunnels behind them. They have almost no technology, but also seem to have some level of understanding of it. The Grendlers, too, operate on an alien form of morality, like little semi-sapient magpies stealing or dealing to get anything that catches their eyes. They’re not evil, though, and are actually shown to be extremely loyal. 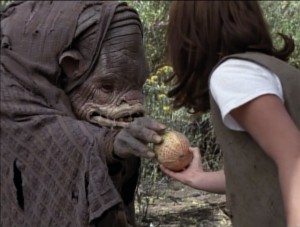 Plus, having an alien species that’s on the verge of attaining intelligence and culture is a really fascinating idea that’s very much underutilized in sci-fi. And actually, with the exception of taking the Gaia Hypothesis far too literally, the show’s not bad in terms of the science, at least as far as your average TV sci-fi goes. The ships travel slower than light and rely heavily on cryo-sleep. Sources of safe water aren’t always the seemingly obvious ones, and the characters are generally smart enough to test things like you would in a survival situation before just sticking their hands in tainted lakes or gorging themselves on poisonous fruit. Devon Adair trading with a Grendler. They’re short, hunched creatures that frequently drool. Annoying children! This is basically the Terra Nova of 20 years ago (both shows were even produced by Amblin Entertainment, Stephen Spielberg’s production company). By trying to make the show “family friendly,” all you really end up doing is cutting out tons of potentially interesting storylines that are deemed unsuitable for children. Luckily the kids drop off in terms of screen time after the pilot, but their presence alone is enough to turn people off the show. Also, as far as Gaal is concerned, his interactions with young Tru are EXTREMELY creepy. He’s like a predatory Captain Jack Sparrow. Definitely deliberate, but still, almost uncomfortable to watch. The show starts off very slow and dull. There’s an “abandon ship” scene pretty early on, and yet even that ends up being boring to watch. 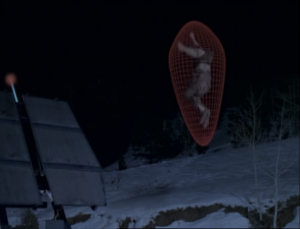 How do you make a scene of people running around and fleeing their spaceship boring? I don’t know, but they managed it. It starts to pick up some around episode 7, but that’s a third of the show down the drain. The special effects are pretty lackluster, even for the 90’s. No awful CGI this time, really, but less-than-expertly-performed model shots and some pathetic “explosions” painted onto the film are quite present. Most of the model work is confined to the pilot and the opening titles, so it’s not a huge deal. Also they really, really want you to know that Hummer survived into the 2190’s. Lot of shots, especially in the pilot, that frame the logo on their vehicles rather prominently. Product placement in sci-fi can help to lend some realism to the future world by inserting the familiar, but if it’s not done well it stands out–for example, the logo is something that you’d expect to change over the course of 200 years… and a company that makes land vehicles is not one I’d expect to survive intact when all of humanity lives in orbit. Alright, I guess it’s time to get back to this Gaia Hypothesis thing. 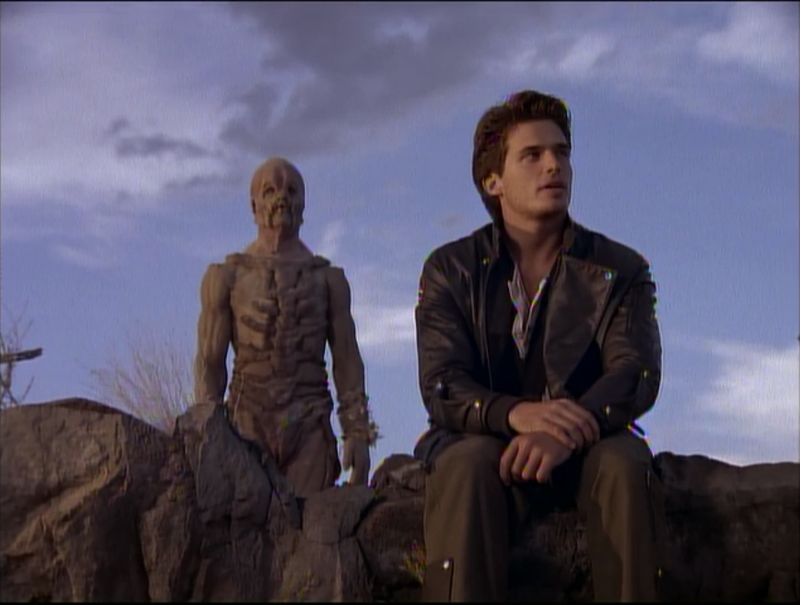 This show is very firmly planted in a 90’s era sense of environmentalism, in the same vein as Captain Planet, or Fern Gully, or other eco-friendly entertainment (incidentally, both of those also featured Tim Curry). It becomes apparent pretty quickly that the show is running off the “planet is actually alive” misinterpretation of the theory, and without getting into spoilers, this realization has a lot of ramifications for the human characters. But since it’s all predicated on this kind of silly misunderstanding, it comes across very heavy-handed, especially when taking the aforementioned backstory into account. If you’ve seen Avatar, you probably have a good idea where this story is going already. It’s all very typical of 90’s environmental messages. Cliffhanger ending! Really, everything that happens in the last episode is so detached from what came before that you can safely ignore it. It’s clearly setting up for a very different direction in season 2 that never came, so while it does link back to some of the earlier plots that had almost been forgotten, as an ending it leaves a lot to be desired. All in all, the show is slow and deliberate, with a handful of episodes dealing with more interesting or exciting ideas that stand out mostly because of how different they are from Earth 2‘s baseline. Some of the running plotlines (for example, a mole spying on them for the fascist governments back home) don’t really go anywhere, and the heavyhanded undercurrent of environmentalist messages informs most of the characters’ decisions, which may or may not make sense in-universe. Most of the characters had never actually set foot on a planet’s surface prior to the start of the series, so it seems really strange that they’d have any concept of conservation or environmentalism at all. According to Wiki, the show started off with good ratings that steadily dropped off until it was watched by very few at the end, and with as slow as the first half is it’s not hard to figure out why people quit watching. I think that in the end, friction between the family elements and the desire to tell a more interesting, arc-based story is part of what killed it. Earth 2 is a textbook case of a canceled sci-fi series: interesting concepts and ideas are present but underused, developing too slowly to capture an audience until finally the network pulled the plug. 2.5/5. A typical example of a canceled show. A quick reminder of my rating system: a 5 represents must-see–a “hidden gem,” as it were. A 4 is good, solid television. A 3 is “cult classic” stage, where the show’s appeal is likely limited to a specific group. A 2 is flawed, but fun, or even “so bad it’s good,” depending on the series and its release timeframe. A 1, of course, is avoid at all costs. For once, we’ve got a show that you can easily watch, as it’s on Netflix! Yay. The audio is a little weird, though. Very quiet compared to everything else on Netflix. Alternatively, you can pick up the DVDs from Amazon. Have any suggestions? Or are there any little known shows you’re a fan of that you’d like me to cover? Leave them in the comments, or send a tweet to @RetroPhaseShift. To keep up with the next entry in the Subjectively Obscure Sci-Fi Primer, you can subscribe to the RSS feed by clicking here. I remember loving this show as a kid, and was planning on watching it again “someday” since I no doubt missed episodes back during the original run. I found your take very interesting — especially the connection to the 90s environmental conservatism (and how you pointed out that people who have never set foot on a planet before may not even consider things that way. I never thought of that.) Thanks for writing it and mentioning the female leader as well. I do have to add that there are a lot of recognizable people other than Tim Curry though! Clancy Brown, Terry O’quinn, Rebecca Gayheart, Antonio Sabato Jr, even Kelli Williams =). From the obscure shows you have watched, where would you rank this and them as far as revivability? I feel like it could be remade by SyFy pretty successfully with some tweaks. A revival is an interesting idea. I feel like any attempt at rebooting it would have to take a more mature approach, though; like I said, it’s very similar to Terra Nova, and that show bombed hard. Getting rid of the family friendly aspects and ramping up the friction between the members of the expedition would be a must. Still, you don’t want to go too far with this and have full on BSG-style “at each others throats nonstop” atmosphere. So you’d need a careful balance of people getting on each others nerves and having personal conflicts while still being able to hold things together and rise above it when the situation calls for it. In other words, as long as survival remains the top priority above personal drama, it could work. I guess the main question would be, “Why revive this instead of creating a new series with a similar premise?” and I can’t really answer that. It doesn’t have much name recognition and the title is vague and generic enough that it wouldn’t jog anyone’s memory even if they did watch the original. The only thing I can think of is if it happened to be doing well on Netflix and they decided to try a reboot or continuation as a result. The episode where we see future Uly was pretty cool, so a sequel series might be the better way to go in that event.